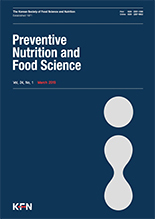 Shanika Jeewantha Thewarapperuma Arachchi, Ye-Joo Kim, Dae-Wook Kim, Sang-Chul Oh, Yang-Bong Lee,(2017).Optimization of Maillard Reaction in Model System of Glucosamine and Cysteine Using Response Surface Methodology.Preventive Nutrition and Food Science,22(1),37-44. Sulfur-containing amino acids play important roles in good flavor generation in Maillard reaction of non-enzymatic browning, so aqueous model systems of glucosamine and cysteine were studied to investigate the effects of reaction temperature, initial pH, reaction time, and concentration ratio of glucosamine and cysteine. Response surface methodology was applied to optimize the independent reaction parameters of cysteine and glucosamine in Maillard reaction. Box-Behnken factorial design was used with 30 runs of 16 factorial levels, 8 axial levels and 6 central levels. The degree of Maillard reaction was determined by reading absorption at 425 nm in a spectrophotometer and Hunter’s L, a, and b values. ΔE was consequently set as the fifth response factor. In the statistical analyses, determination coefficients (R²) for their absorbance, Hunter’s L, a, b values, and ΔE were 0.94, 0.79, 0.73, 0.96, and 0.79, respectively, showing that the absorbance and Hunter’s b value were good dependent variables for this model system. The optimum processing parameters were determined to yield glucosamine-cysteine Maillard reaction product with higher absorbance and higher colour change. The optimum estimated absorbance was achieved at the condition of initial pH 8.0, 111℃ reaction temperature, 2.47 h reaction time, and 1.30 concentration ratio. The optimum condition for colour change measured by Hunter’s b value was 2.41 h reaction time, 114℃ reaction temperature, initial pH 8.3, and 1.26 concentration ratio. These results can provide the basic information for Maillard reaction of aqueous model system between glucosamine and cysteine.